Wild hogs in Florida? Yes. We’ve got those. In fact, we’ve got a lot of those. After living in Florida for over a decade, we have seen wild hogs only once. They were gathered at the edge of a forest on the side of a freeway on a long open tract of land with no homes or businesses. However, living in Pinellas County, Florida, the home of Clearwater and St Pete Beaches, it seemed that no such animals lived nearby. We were surprised to learn that they did actually live in our county. Giving it some thought, the region does have some large open tracts, in addition to being the most densely populated county in the state. So, if wild hogs can live within a small, well-populated area in Florida, couldn’t they live just as well or better in the other parts of the state? You guessed it. They do. 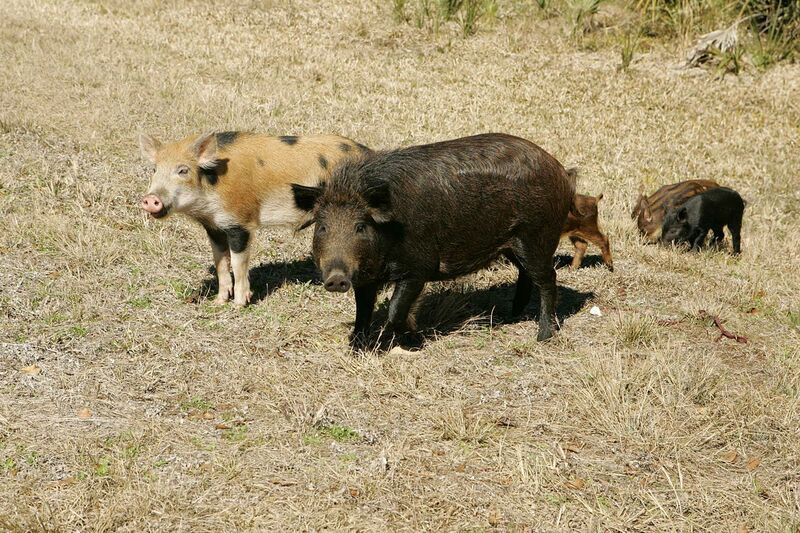 Florida has over 500,000 of the southeast USA’s feral hog population, which numbers from 1 to 2 million. That’s a bit of a hazy headcount but wild hogs like to live in places that humans don’t. Low lying, swampy lands unattractive for housing suit the pig population just fine. That means a cluster of hogs might be living somewhere you never imagined them being -until someone tells you. We were quite surprised to find our county on the list. And, in fact, the tally includes every county in the state! The largest population of hogs, not surprisingly, lives in the Florida Everglades. If you’re worried about a wild hog encounter, please don’t. You will not have feral hogs wander up to you while you are on the beach of a resort town. If you enjoy hiking through muddy, shin deep waters amid swarms of mosquitoes and chiggers while strolling through the cypress forests, well, that’s another story. Yea, we didn’t think so. 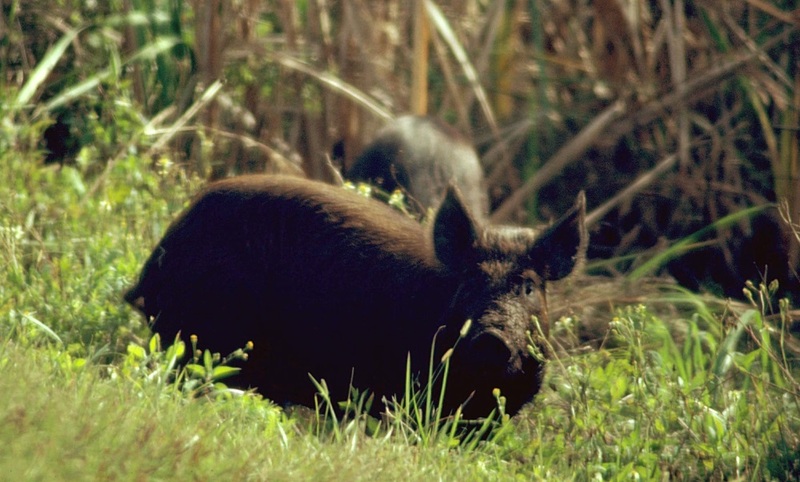 The feral hog population of Florida, and the U.S. for that matter, is considered an invasive species. They root up soils, sully rivers, eat crops, and damage golf courses. In short, they are considered a nuisance animal. They were introduced to the country by famous explorer Hernando De Soto in the mid 1500’s. They are large compared to most other animals in the region, averaging 150 pounds, and tend to out-compete other species. Added to their list of charming qualities is that they can be hostile to humans when encountered. Thanks to all those wonderful traits, it’s open season on the wild hog population of Florida, literally. Hog season has no downtime and both males and females are fair game. They are the second most popular game hunting animal in Florida, second to deer. Can you eat them, though? Yes, you can. Unfortunately, like most wild animals, their meat is tough and stringy. Despite that, there are places that serve them. Because of diseases which hogs and humans can share, cleaning the animals requires USDA supervision so, no, you cannot kill and eat your own hog. We know. So disappointing. As far as safe eating, they are on par with domesticated pigs. 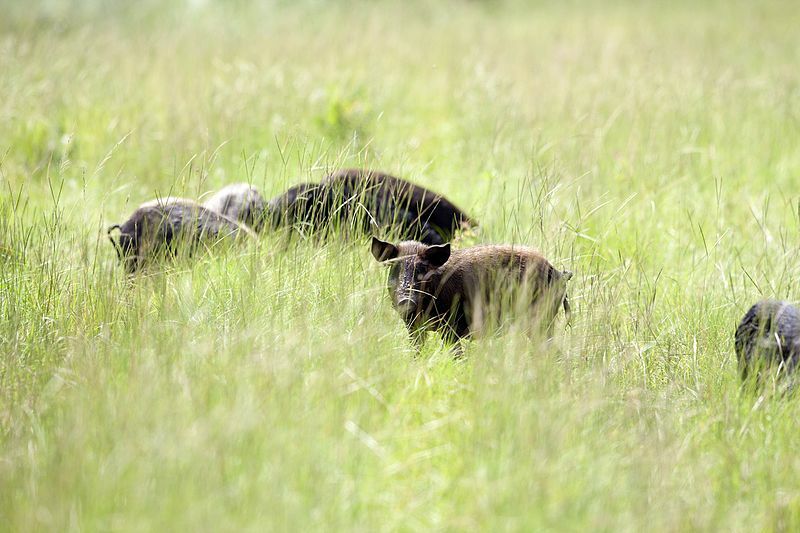 So, will wild hogs be part of your next Florida vacation? We don’t think so. While they are truly “everywhere,” you would be hard pressed to find one. Hunters may make different vacation plans for Florida, but we expect the only hogs you will encounter on your Florida amusement park or beach vacation will come in the form of pork chops or bacon on your plate.